Super Users can access all menus and manage all settings on the Admin page of your VEVS website, while Regular Users have certain access limitations. You can add as many users of each type as you need. In the sections below you can read more about both user types. 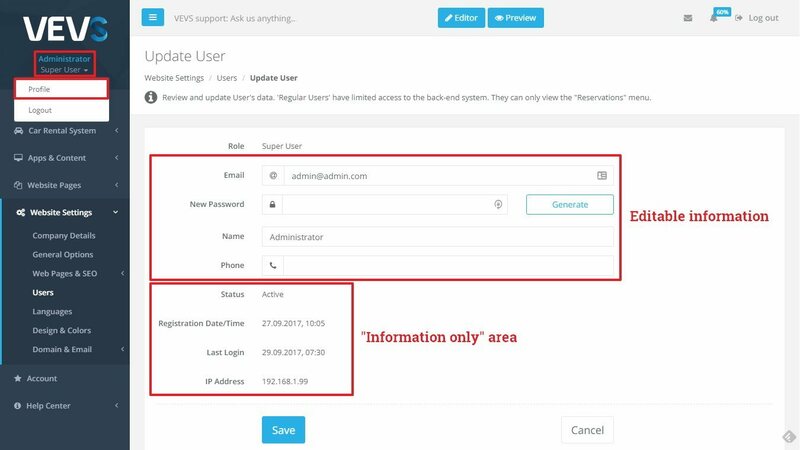 The Super User can access and change all settings on the Website's Admin page. By default, when you create a VEVS website, you get a Super User account for the email you have signed up with. Super Users can manage all website's aspects and most importantly the business-critical ones. Hence we recommend you to give Super User access rights only to your trusted partners and top-level staff. This will limit the access of third-parties to confidential information and prevent potential malpractice. The Regular User account type is intended mainly for the staff employees that will need to have access only to specific parts of your Website's Admin system on a daily basis - for example, to view and update bookings and customer details, keep track of payments, etc. They will not be authorized to make any changes to the system settings. Regular Users can only access the software options related to the specific business website type (e.g. Car Rental System, Car Dealer System, Job Portal System, etc.) and only some of the general Website Settings. Each type of user can edit his/her User Profile details and password. While Super Users have access to the Users menu and can change any user's details they want, Regular Users can access and alter their User Details and Password only through their Profile Settings page. This information can be useful if you have noticed any suspicious activity for any of the User profiles.